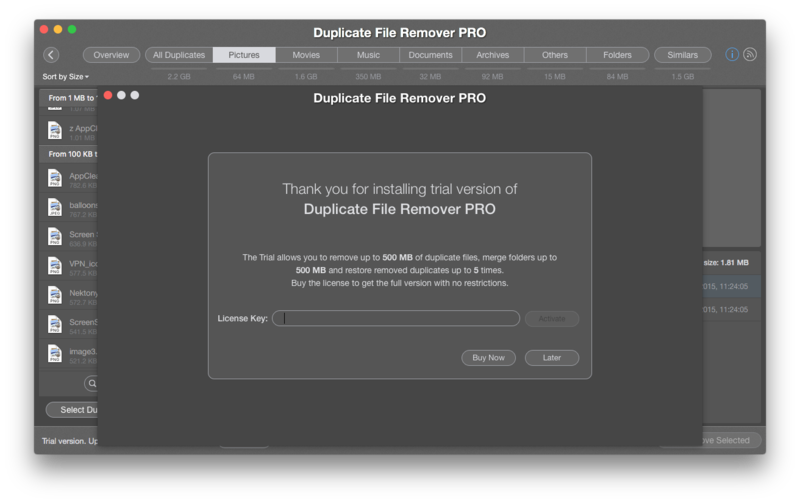 Duplicate File Remover Pro is an essential software tool for Mac, which allows you to easily get rid of useless duplicates on your disk. You can try Duplicate File Remover Pro absolutely for free. Just download the Evaluation version and you will be surprised at how quickly it works at finding duplicates. Remove up to 500 MB of duplicate files. Restore removed files up to 5 times. Merge folders of up to 500 MB. Remove an unlimited number of duplicate files. Restore removed files an unlimited number of times. Merge folders of any size an unlimited number of times. 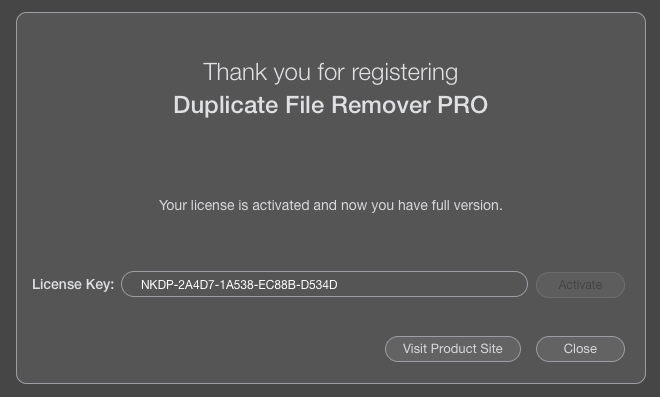 If you have already downloaded Duplicate File Remover Pro, launch the app and, in the Menu bar, click Duplicate File Remover Pro → License Info. After a successful purchase, you will get an email with the License Key. Please note, a letter can get into a Spam folder, so check the folder if you don’t see a letter. Then enter the serial number in the Licence Key field, and click to Activate. to free up more space on your MacBook or iMac.